Viewpoint Previous Issues - see bottom of this page. In the early days of Sky+, late 2001, many advanced features were being considered by Sky, including the fabled "Dual Recording". Some of these ideas were exposed to customer focus groups for their thoughts and opinions. 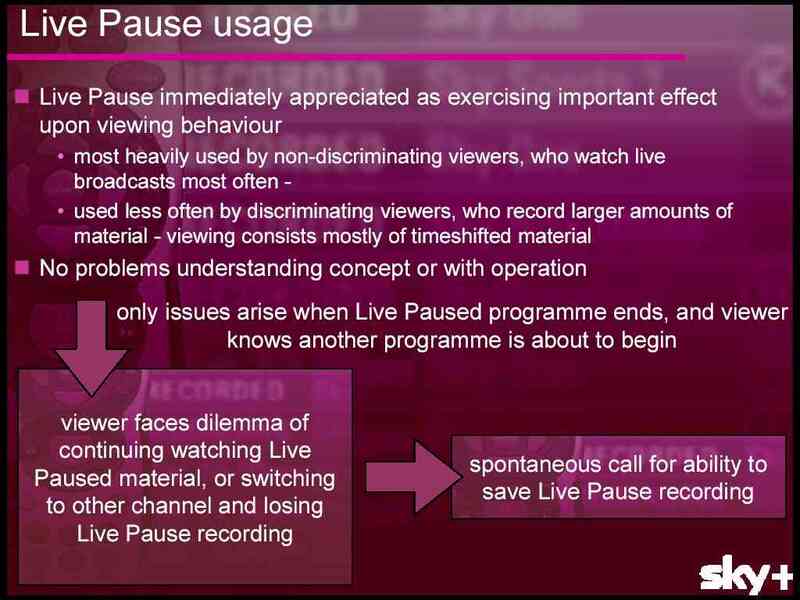 However there was one issue that the viewers in the focus groups suggested all by themselves without any prompting - that was the issue of live pause and what to do when a live pause programme clashed with the desire to watch another programme in real time. Here are some slides from the analysis carried out at the time. 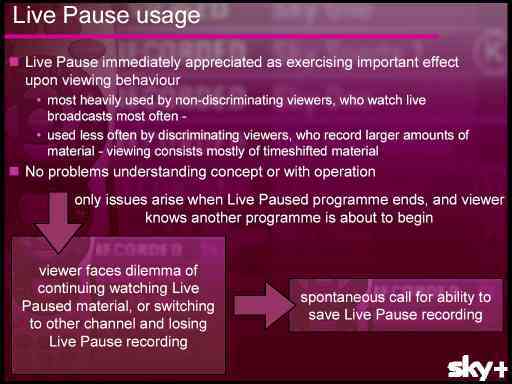 Slide number 1 talks about the dilemma faced by viewers who used live pause and the author recognised that the "spontaneous call" for the ability to Save Live Pause was a noticeable requirement from the groups. The expectations of users was then mapped out onto a presentation to explain a possible scenario for the use of Save Live Pause. 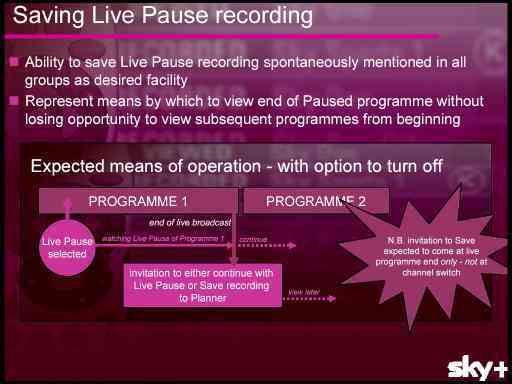 In the example below the author has specifically defined that the Save Live Pause choice comes at the end of the programme being live paused, and by looking at the example, the author assumes that the "Programme 2" starts after the end of "Programme 1". 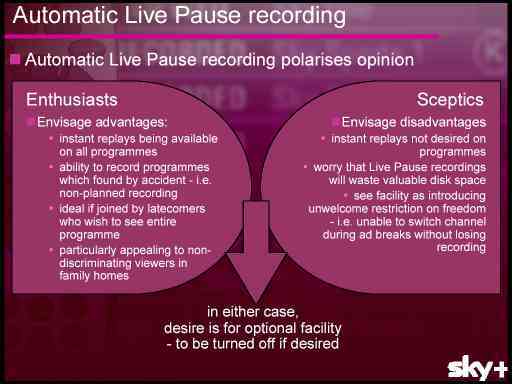 This was assumed for one simple reason - at the time, Dual Recording planning was in its infancy and an ability to save live pause at any other point of the programme other than the end, would have effectively introduced "Dual Recording by the back door". With the complex tuner management, on screen message design and testing, the ability to save live pause at any other time other than the end of a programme, seemed like a non starter. However the good news now of course in 2003 is that Dual Recording is a matter of days away, and the ability to save a live paused recording could now be implemented at any time of the programme because the necessary tuner management routines and on-screen messages have already been written for Dual Recording. The big question for Sky+ users is: Will Sky release the new software update for Save Live Pause at the same time as Dual Recording? Logic says, we have waited long enough, Sky must have been able to do all the testing they needed to do by now - when Dual Recording is released, so should Save Live Pause. Of course, logic is tainted by risk. Sky are about to undertake a multimillion pound advertising campaign for Sky+, highlighting the ability to record 2 channels simultaneously. Would they really want to risk all that hard work, with an "extra layer of complexity and risk" with Save Live Pause, even if it is ready to roll out. The answer is I'm afraid, we will have to wait and see. But one thing is for sure with Sky+, new features and improvements will keep on coming - and Save Live Pause is one of the most important enhancements planned. The last slide is note worthy for a couple of reasons, one is that it highlights the different views of viewers who see such an option as Automatic Live Pause Recording as either beneficial or intrusive. 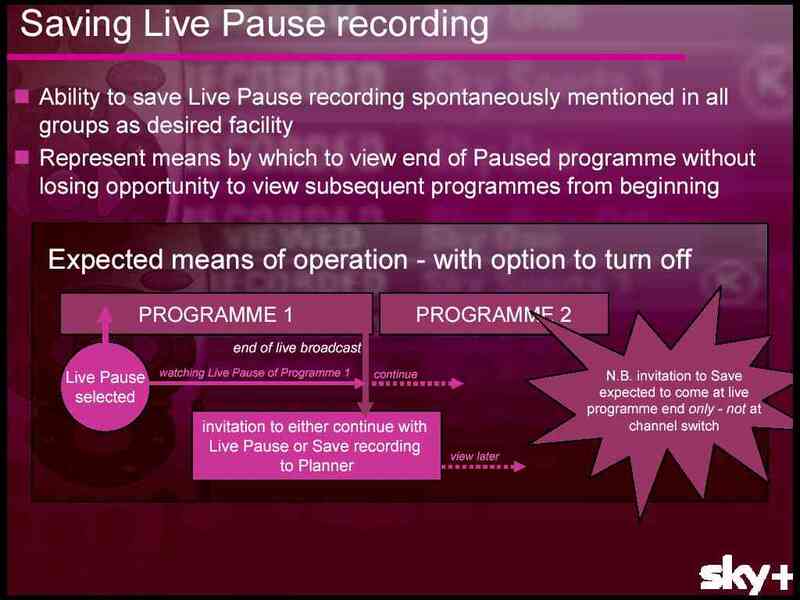 The other interesting point which is not made entirely clear in this slide, is that although we now have Instant Rewind Buffer up to an hour, there is no way of saving the recording permanently. Is this slide pointing to the Tivo like PVR function of stitching together what is previously in the buffer with the current live pause recording so that a whole programme can be saved immediately? In the same way as the Instant Rewind Buffer - Automatic Live Pause Recording would be a feature that could be turned on and off in the Sky+ Services menu. Do you have any opinions on Save Live Pause?